The skeleton of “Joe” was spectacularly preserved, from the end of the nose to the tip of the tail. 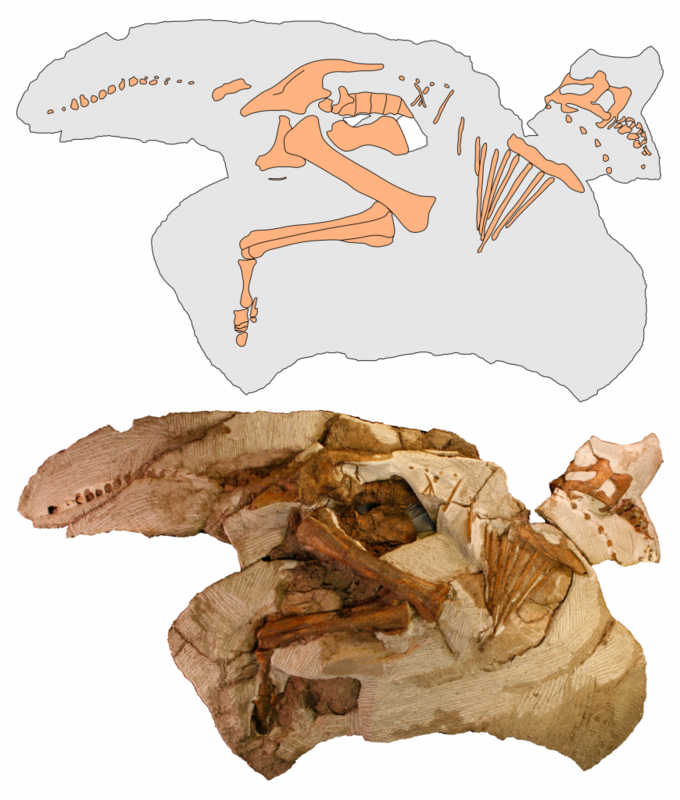 The bones were even still articulated–that is, in their approximate life positions. The only portions of the skeleton not represented were the arm below the elbow, the end of the tail, and a few other scattered bones. The head of “Joe” was arched back over the neck. Previously, scientists had thought this posture represented the death throes of the animal. However, experiments with chickens show that the neck arches on its own when carcasses float in water. Because “Joe” was found in an ancient river bed, this makes sense as an explanation for the posture seen here. The skeleton of “Joe” in side view from the right, showing the preserved bones. The top image is an interpretive drawing based upon the photograph. A reconstruction of the complete skeleton of “Joe”, with missing parts modeled after related dinosaurs. Reconstruction copyright Scott Hartman. Want to learn more? Take a tour of the skeleton of “Joe” with Dr. Andy Farke in the video below. Want to explore the skeleton of “Joe” in 3D? Check out the Digital Joe page!